If you ask my husband what his favorite meal is (that I make, anyway), he will tell you it is these enchiladas every time. They aren't very healthy, so we save them for semi-special occasions, like his return from a business trip the other day. We celebrate the small things around here. 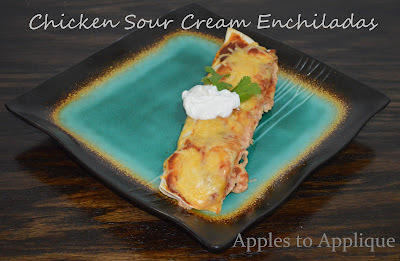 :) I do make it slightly healthier by using reduced fat sour cream and cheese, but it's still not the healthiest thing in the world, which is probably why they're so tasty. We can all indulge a little sometimes, right? These enchiladas are in no way authentic Mexican food, but they are delicious, and they mix up quickly--especially if you have some chicken that is already cooked and shredded. I like to precook both chicken and beef and keep it in my freezer, ready for recipes. It saves so much time to just cook a bunch up at once! Shred chicken. I like to shred it in my mixer using the paddle attachment; it gets it so much finer than when I just use a fork. Plus, it's way easier! Thank you, Pinterest! Spread a few tablespoons of salsa on the bottom of a 9x13 pan--just enough to lightly cover the bottom and keep the enchiladas from sticking. Add the sour cream, 2 C of cheese, and about 3/4 of the jar of salsa to the chicken. It doesn't have to be exact, but you want to save enough salsa to cover the enchiladas before baking. Give it all a good stir. It will be a little sloppy, but shouldn't be runny. Add more cheese or salsa if you want to change the consistency a little, or to better suite your tastes. This recipe is very forgiving! Spoon about 1/2 C of the mixture into the middle of a tortilla. Cover tops of enchiladas with remaining salsa. Cover with foil and bake for about 30 minutes. (If you are making them ahead of time, go ahead and put them in the fridge at this point. When you are ready to bake them, increase cooking time to about 45 minutes). Remove from oven and top with remaining 1 C of cheese. Return, uncovered, to the oven and bake for an additional 5 minutes, or until cheese is melted. Serve with a dollop of sour cream and some cilantro, if desired. Enjoy! I hope your family likes this recipe as much as mine does!